This cleverly integrated design is ideal for serving chips and salsa with one piece. 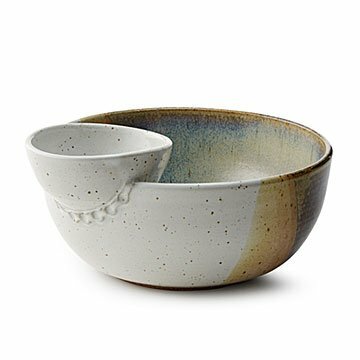 When serving chips and dips, replace the random array of bowls with this cleverly integrated design. Potter Steven Nedza throws the large and small stoneware bowls, then combines them in a strikingly modern intersection of hand-built hemispheres. Beautifully glazed and fired, each finished piece is one of a kind and an elegant essay in form follows function. It makes a great gift for anyone who loves to entertain in smart style. Handmade in Watkinsville, Georgia. Steven graduated with a Bachelor of Science degree in Computer Science from the University of Georgia. He established a career in health care as a Computer Network Engineer and Sr. Business Analyst for over 18 years. Since Steven's childhood, pottery always captured his attention and he got a chance to pursue that passion later in his career. Steven says, "clay is captivating as it captures the imagination of the artist and allows the artist flexibility with design creation. My cousin loves chips & dip (who doesn't?) This was a great gift; something I'd get for myself too.